Let them know that you wish you could be there with this birthday collection. 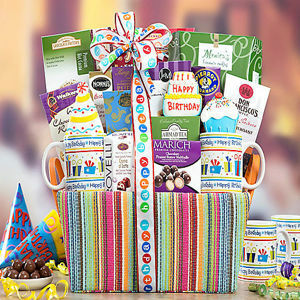 J&M cappuccino & chocolate chip cookies, French roast coffee, Italian pralines, pomegranate puffs, brownie cookies, caramel lollipops, kettle corn popcorn, English teas, chocolate toffee, three fresh baked birthday cookies and more arrive in this colorful basket. Two birthday mugs will help convey your best wishes and remind them of this gift after all of the contents have been enjoyed. Gift Size: 15" x 7" x 13"